By way of PZ Myers is this blog post by Mano Singham about the problems with The Bell Curve. Singham mostly quotes himself from his response to The Bell Curve in 1995. For the reader who does not share the ideology propounded in the book, another curious (and highly irritating) feature is the authors’ ingratiating efforts to co-opt readers into believing their thesis. They appeal to the reader’s vanity with statements asserting that the fact that the reader has waded so far through the book is a sign that the reader has a superior I.Q. Like many of the assertions in the book, one could quite convincingly argue the opposite. 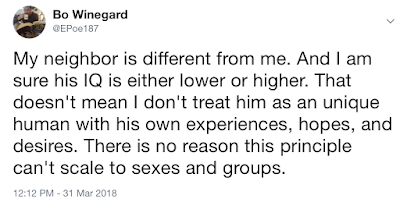 Because hereditarians are mostly members of the "group" they, just coincidentally of course, consider the most intelligent, white men, they are therefore sanguine about the potential problems of branding various "groups" as less intelligent as we see wingnut welfare recipient Bo Winegard do on Twitter. 'When all the dust settles, the authors of The Bell Curve are merely saying that the people and groups who dominate our society do so because of their intrinsic ability and merit, that this is the way things were meant to be, and that they and those like them should be benefited even more. When has it ever been an act of courage to assert that those in power have a natural right to that power? True, the authors were subjected to some scorn in the scientific community because of the flaws in their work. But facing those attacks does not imply courage. It takes courage to defend the powerless against the powerful; it merely takes gall to claim courage for defending the privileges of the powerful. 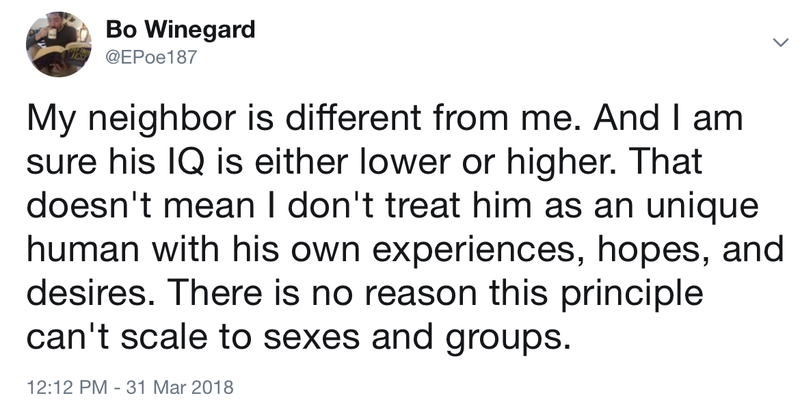 We Leftists don't disdain people who aren't intelligent, we disdain people like Bo Winegard who presume to defend evolutionary psychology in right-wing rags by proclaiming the many scientists who criticize evo-psycho as "just-so stories"(including Stephen Jay Gould and PZ Myers) simply have "a faulty understanding of science" unlike him, Bo Winegard, "Professor at Marietta." I couldn't find anything via Google that connected him to "Marietta" which I must assume is Marietta College in George but really WTF knows? Winegard is off the Dunning Kruger effect chart. Nobody is denying genetically caused IQ differences. This is the standard strawman of the hereditarians, conflating evolutionary psychology with evolutionary biology. Simply stated, [Murray and Herrnstein’s argument] goes like this: If the variation in a particular individual trait is caused by genes, then the difference in average values of the trait in populations must also be caused by the genes. In the I.Q. debate, this argument takes the following form: variation in I.Q. among individuals in a population is caused (to a large extent, at least) by each individual’s genes. For group A, the average I.Q. score is higher than for group B. Hence members of group A must, on average, have higher I.Q. genes than members of group B. However plausible this sounds initially, the fallacy of this logic becomes immediately obvious with a little thought and the use of a popular analogy. If we randomly take some corn seed and plant it in uniform, rich, well-tended soil, we will get a distribution of plant heights whose variation is caused by their genes. If we take a sample of seed from the same source and plant in poor soil, we will again get a variation of heights that is caused by the genes. But the second group will have a lower average height than the first, even though the plants come from the same gene pool. This difference in average values is caused by the environment and not the genes, a fact known to every farmer. So it is possible to have a variation that is purely genetic in some trait within a single group, while the difference in average values of the same trait between different groups is caused purely by environment. For example, the variation in individual heights has a substantial genetic component. But in Japan, which has been a relatively isolated country, average heights have risen considerably since World War II, a fact easily explainable by better nutrition. Bingham points out how poorly defined both race and intelligence are. It is safe to say that, despite decades of effort by very determined people, we are not much closer to a definitive answer to the question of the roles of race and intelligence in the processes of social and economic stratification of society. All kinds of hypotheses can be invoked to explain the data. And this shouldn’t be too surprising. As I emphasized above, both race and intelligence are poorly defined and operationally ambiguous. When you have two variables that are ill-defined, it is asking too much to expect a simple relationship between them to emerge. But of course if you are motivated by right-wing beliefs, like Bo Winegard and the people who publish his crap, you won't care about the inconvenience of ill-defined variables, you will simply hand-wave the problem away. An then you will: declare the matter settled in favor of the superiority of white men; point out that just because your neighbor might be a member of the stupid group doesn't mean you'll hate him (unlike those Leftists) and; anybody including actual scientists who suggest that evolutionary psychology is full of "just-so" stories has a faulty understanding of science. Unlike Bo Winegard "Professor at Marietta."